Room with one double bed or two single beds and kitchen/dining area. 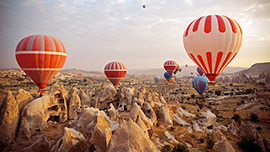 Closest Airports: Istanbul (IST) Ataturk Airport (22 minutes distance) , Sabiha Gokcen (SAW) Airport (45 minutes distance). 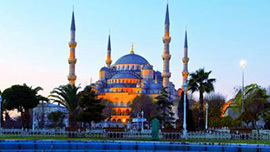 Situated in Aksaray within a 30 minutes walking distance of Bodrum Mosque, Grand Bazaar and Suleymaniye Mosque. This hotel has its own restaurant serving breakfast, lunch and dinner where you will find a selection of items to try and appreciate.Leisure facilities include a health club, a Turkish bath, a spa tub, a sauna, a steam room and massage rooms so there is always something to do. Free WiFi and Internet access is available. Buffet-style breakfast is served on the hotel’s terrace, with a scenic view of the Marmara Sea. 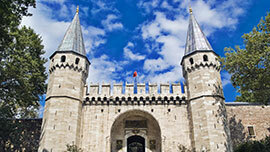 Located in the Yenikapi district with 3 minutes walk to the Yenikapi Train Station and Yenikapi Ferry Port. 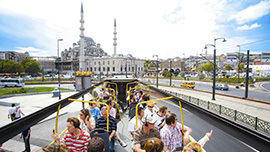 10 to 20 minutes walking sitance to Suleymaniye Mosque, Hagia Sophia Museum,Grand Bazaar, Blue Mosque, Topkapi Palace and Hippodrome. 22 minutes distance from Istanbul Ataturk airport. Turkish and International cuisine is served at the Terrace Restaurant having a view of the sea. Bars and restaurants serve non-alcoholic drinks only. Breakfast service in the room is also available.